What is it about being pregnant, that makes people feel no question big or small is out of bounds? Colleagues I barely knew were asking me all sorts of intrusive questions that I didn’t feel comfortable answering. The strangest comment we had though was made to my partner, where one of his colleagues asked if he could name our child. I’m sure plenty of you were asked some of these and plenty of others. Not one but two male colleagues said this to me during my last week at work. Both of whom are dads themselves. I challenge anyone that thinks maternity leave is a holiday to give it a go themselves. This comment upset me and really made me feel negative towards said colleagues. I mean, if they’re prepared to say such a thing to me, what do they say to their wives?! This would be flattering during the first few months of pregnancy, but at 7 and a half months I found it a little disconcerting. Several people said this to me and I’m sure they all just thought I was fat rather than with child. This was probably the rudest and nosiest question I was asked. It asked by someone I’m not close to at all, in fact we hadn’t spoken for months and this was the first thing she said to me to break the silence. This one really annoyed me. To be fair, the person that said it to me didn’t know I was pregnant at the time, but she was referring to a colleague that was due to go on maternity leave a few weeks later. 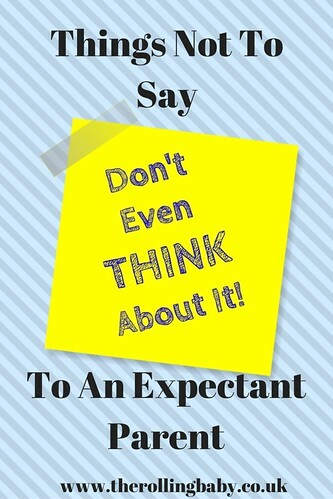 I’d told this person I was having a girl and yet she continued to touch my bump (!) and tell me it was a boy. We were happy to share this information with close family, but it was colleagues that were pestering us to know the name we’d chosen and we really didn’t want to divulge that until after she was born. This was a genuine proposition that my other half’s colleague asked him. Um…no, I don’t think so. What was even stranger was that his wife was due to have their child just a couple of weeks before our little one was due so it wasn’t like he wasn’t getting the opportunity to name of a child of his own! I’d love to not have to go back and to be a full time mum as I don’t want to miss out on her growing up, but financially I’m not in a position to do that. When you’ve got so many colleagues telling you the same thing, it almost makes you feel like they don’t want you to go back! Before we knew the gender, I was asked this over and over. I did have a preference (a girl) but I didn’t want to share that as I’d have felt so bad if the scan revealed she was a boy. 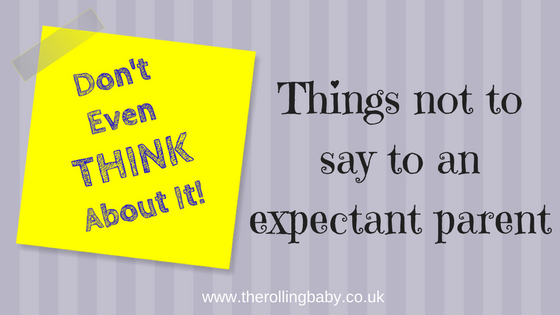 I’d love to hear any other things you shouldn’t say to an expectant parent, so please share them in the comments section below.